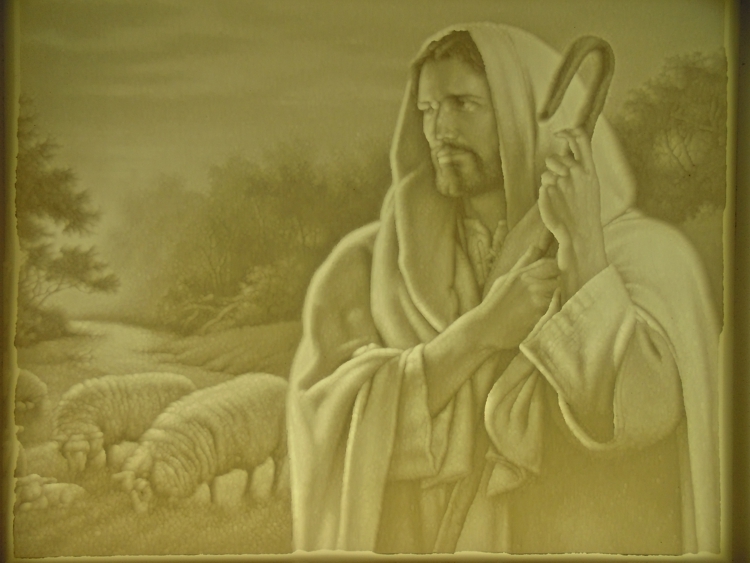 PicDither - PicEngrave - PicLaser. Anything relating to - PicDither - PicEngrave - PicLaser etc. 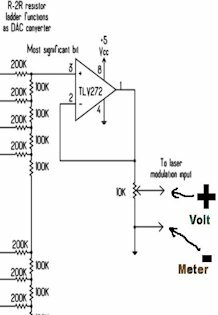 To set up your laser diode controls, these guideline should help. It has been some time since I set mine up, so I’m writing from memory. DO NOT CONNECT your laser diode until all adjustments are completed and verified. 1 - With the DAC connected to your stepper driver (C axis? ), connect a DVM to the DAC output, which is the center tap on the first trimmer (not the trimmers on the added circuit). Set the Mach3 C axis to zero and turn on power to the DAC. Reset the DAC by momentarily pushing the switch. The DVM should now read close to zero volts. Don’t worry if it is not at exact zero, but it should be less than .5volts (<500 mv). If it does not, stop and recheck your connections. 2 - Next, set Mach3 for maximum output (C -0.0255?) and adjustthe trimmer on the DAC (not on the added circuit) until the DVM reads 5.0 VDC. Again, if it will not adjust to 5.0 volts, then something is wrong and needs fixed. 3 - Now connect the DVM to the output of the added circuit. Set Mach3 C axis to zero, and adjust the bias trimmer to zero volts. 4 - Set the C axis to maximum, and adjust the gain trimmer to 5 volts output. 5 – Repeat steps 3 and 4 as needed since there may be some interaction between them. You should now be ready to connect your laser diode driver to the DAC and proceed to adjust it. I strongly advise you to leave the laser diode unconnected until you are positive that the DAC and laser diode driver are properly adjusted and functioning correctly. I cannot give you the steps needed to actually setup and adjust your diode driver as I have not set one up myself (I use a different type driver). But I strongly advise you to build a dummy load and use it for all setup and adjusting until you are sure all is working correctly. A dummy load circuit consists of some silicon diodes and a 1.0 ohm resistor in series. (http://odicforce.com/page/23) A DVM across the resistor will read 1mv for each 1ma of current through the resistor. As usual, upgrades are free to registered users. Thanks for the help I think it will help me a great deal. You mentioned in something you wrote me about that I should not use the 5V for the laser driver for anything else. does that include the brake out board and the relay for the spindle off and on. I also was planning on running the fans on the 12V line, from that same power supply, for my laser heat sink. Yes or no??? I added a line for two switched Z axes stepper motors ( One for Z and one for the encoder ) and I am planning to put that neet contraption of Jeff's with the encoder into the mix but at this point I don't know why or what I am even doing. I don't know if you can safely power fans and a breakout board and a relay from the same power supply as used for the laser driver, BUT, after having burned out two diodes because I used a common power supply, I won't make that mistake again. I think my problems were caused by stepper motor feedback causing spikes on the power lines, but I am not sure. Since isolating the laser driver to its own power supply, I have had no further problems. It's possible you could power the fans OK, but I would not risk powering the relay with the same power supply. There is no way to be sure but to actually do it, but is the risk worth the cost of another separate power supply? I'm back together and I am in the tune-up mode again. I did use the 5V power supply for the laser only. Thanks for the help! I ordered the parts for building the test and setup laser. I do have a few questions that I am having trouble with. (What's new)? On the line one (1) : No laser attached, to set the volts, Do the leads to the laser need be open or shorted? I do not know how to make Mach3 turn C on or off without running a program. (C0, C-0.0255?) I think it has something to do with MDI, or something??? I don't believe that you have a physical Z axis on your laser, so it might be easier for you to use the Z axis to control your laser rather than use the C axis. You will not have to modify your screens if you use Z, and you can always switch back to the standard Mach3 screen set if/when you want. In Step 1, neither the laser diode nor the FlexMod laser driver should be connected. To use Z to drive your laser, set the Steps per in Mach3 to 10,000. Then a Z0 will set the laser at minimum power (0.0 volts) and a Z-.0255 will set the laser to maximum power (5.0 volts). 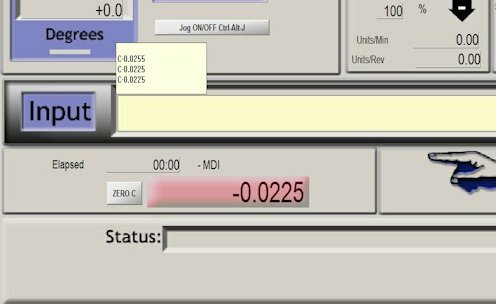 On the MDI (Manual Data Input) screen of Mach3, click on the Input box and enter Z0 followed by Enter, and the Z axis DRO should go to zero. Entering Z-.0255 and the DRO should go to -0.0255. John I messed up somewhere. I only get 0,206 V in step two and step one (post 281). I rechecked continuity on the DAC and don't fine anything out of sink. My power supply is at 5.16 V. I am still using C as that is how the CO2 laser is set up. The Co2 only uses the direction pin and that laser still working ( Switched with 6P2T toggle). I think I must have a problem with the DAC but I don't know how to test it. Do you have any advise, other than start over? When I first turned it on there was a short to ground in the 5+V that goes to the laser driver. The driver was not attached and I cut the short out. Could that possibly be a factor? No blue smoke got out and nothing turned red. Are you sure you have Mach3 set up properly to output steps on the C axis? What Steps per are you set for? If you adjust the DAC trimmer from one end to the other, does the 0.206 voltage reading change? If yes, then how much? It is a simple voltage divider, and at one extreme the voltage should go to 0. Jerry, do you have a C axis DRO on the Mach3 screen set you are using to adjust the DAC? If not, then add one as it will make adjustments and operation easier. My steps per are 10,000, Velocity 150, and Acc 37.5 on C. I think it is working because it will work on the CO2 laser but it only uses Steps. Disconnect the trimmer and measure its resistance. Leave it disconnected and out of the circuit until you get the op amp to respond to hi and lo step values. Can you post a wiring diagram as built? Tis the season for making night light gifts with PEP 4. Is the material Corian ? Yes it's Corian. I cut it with a 1/32" Ball End Mill with a .005" Pixel Resolution. I normally cut them at 50IPM, but was getting a blended feedrate of around 35IPM. Since I have changed my router's ratios to get higher BFR, I used Analog Laser Option this time with a set 60IPM feedrate and 50% variable feedrate change. This new option John added will slow the feedrate down in the deeper cut areas so the small tool bit I use won't break. I most likely can even run them allot faster this way to save on engraving time. I double checked the circuit and detached the trimmer. It is built as your October 2013 Analog Laser Diode Setup Manual states. All my +5v and grounds are as indicated in the manual. All the pins at the resistors (2, 14, 11 and 6)are at about 2.5V.. Pin 15 (step pin) at 0.202V at C0.000 and 5.19V at C-0.0225. Pin 10 (Dir. pin) stays at 2.8 no mater what??? I removed the wire between the modulation out put Pot. wiper of the DAC and the Bios wiper at the pot on the trimmer. That modulation Pot. wiper is where I am attempting to get my voltage readings. I also changed the TLV272 to see if it might be bad. It's still broke. Do you think it might be time to start over? Wow!!! that is great. What are the dimensions of that Picture and isn't that the stuff they make sinks out of ? And does light go through it? And does it sound like I'm picking your brain? I like it ! The size is only 3.75" wide by 3" tall (night light size) and yes that is Glacial white Corian counter top material made by Dupont. It looks kinda brownish because of the florescent light I used behind it. I buy the automatic LED night lights from Walmart and mount them on the top in the back of them. They make great holiday gifts. John's program works great for Lithophanes too. Wait, that is what his program started out before he added the laser engraving options. His one of a kind program does it all now. That is very good. I know someone will be very pleased this Christmas. I'm glad to have you confirm the feed rate change worked with spindle engraving. I'll try it this weekend. Starting over will not assure finding the problem. Best to continue to troubleshoot what you have. The direction pin should toggle between 0 and +5 volts. No need to test more until you find out why it is not doing so. Disconnect the dir. pin from the circuit to test. If it tests OK disconnected, reconnect it and proceed to the the next test. The op amp (TLV-272) in the DAC is a voltage follower, so disconnect it (remove it from its socket) and do the voltage tests on pin 3 of the op amp socket. It you don't get close to 0v and 5v, then there is something wrong associated with the MSB/LSB chips. If these chips are OK, then your problem has to be associated with the op amp. Don't forget, each time you power up the main chips. you must set the C axis to 0 and then push the reset switch. Are both Step and Direction pins suppose to toggle between 0 and 5 volts when you toggle between C0.000 and C-0.0225? I checked right at the brake out board On pin 16 and 17 (set up for step, active low and active high, port 1 in Mach3) and there was no change in the voltage either way or either pin. I'm not sure how many pins are able to work through the parallel port of the computer. Maybe I'm out of room? I think I'll try it where I have my A drive tomorrow and see if that will work. This hard work makes my brain tired. I'd like to go fishing to rest up but it is -4 outside. First, there's always Florida - 80°F+ here today - 72°F right now. The direction pin is a toggle, and it will remain in the last commanded direction/state - 0v or ca.+5V. The step pin carries the signal data, and I doubt a DVM will give an accurate reading, but it should show something is happening if a step signal is being sent out. All the pins of your pport are usable if properly configured, so that is not a problem. Rereading your post from yesterday, I am wondering if maybe you have your step and direction pins reversed in your Mach3 settings? Please double check. Look at the bright side, think about how much I can save by not having to use my freezer. It was at minus 14 this morning on our way to town, it did worm up to 5 above by this afternoon. But if you don't bring the ice cream in and put it in the freezer it gets to hard. I got it to work !! but it is sort of goofy. It will reset to zero (0) each time but it will not go all the way to 5 volts, it is different each time I tried. 2.7 volts was the lowest and 4.75 was the highest. I tried it about 5 times. I will put the (TLV-272) back in and put the pot on and see what it does. The problem: there was a solder bridge at the pin 3, of op amp, to a ground. There's something to be said about old people and being more careful but I can't remember what that was either. One time it will reset. The next time it will go to Zero but as soon as I let go it will return to the volt setting it was on. The next time it resets. One time it will go to 4.7 volts. The next time it will go to 5.13 volts. The next time it will go to 3.5 and so on. Each time I would return to C0.000 and reset. This is very spasmodic (I'm not sure about this word) but it is all over the place. I heat my shop with a wood stove and I can't find big enough logs to keep up with the temperature, do you think cold would be a cause for this, other than limiting the time I can stay out there.